[caption id="attachment_214" align="aligncenter" caption="Millcroft Inn & Spa, Alton, Ontario"] [/caption] [caption id="attachment_215" align="alignright" caption="We were served dinner in the popular dining pod overlooking the millpond waterfall at the Millcroft Inn."] [/caption] I'm settling into my Croft suite at the Millcroft Inn & Spa following an awesome seven-course tasting menu. The dining room manager suggested a superb 2002 Rief Estate Merlot First Grow to pair with our main dish of local venison prepared by the Millcroft's executive chef, Roberto Fracchioni. Roberto (aka Frac) is a culinary wizard. Not only are his meals extraordinary, he's personable which is probably why his cooking classes are so popular. Held once a month on Saturday afternoons, they fill up quickly so, if you plan to try one out, book early. You can get more information on them from the Millcroft website but I did check out his next two classes. September 19th is on garlic and October 17th will cover festive entertaining. The Millcroft is on a 100 acre spread in Alton, Ontario, 45 minutes north of Toronto and the Toronto Airport so, it was a good choice for our weekend stay. I am traveling with a food writer from Vancouver who is flying out on Sunday afternoon. I like the Croft suite I'm in. It's loft style with a relaxed, Canadiana feel. [caption id="attachment_221" align="alignleft" caption="Millcroft trail to Alton Mill"] [/caption] The fireplace burns real logs and there's a stack of them piled beside the hearth. The furniture is a mix of knotty pine, big L-shaped sofa, blanket box coffee table, flat screen TV and I've got a screen door out to my own private patio. My upstairs bedroom overlooks the inn's heated outdoor pool. We've been on tour all week and have eaten an incredible amount of food at four Ontario resorts so, I took advantage of the pool this afternoon and swam some laps.Later, I walked over to the Alton Mill via the Millcroft's trails. The innkeeper tells me these are well used by her guests who often try out the inn's mountain bikes and cross-country skis on them. Unfortunately, I arrived at the Alton Mill after 5pm so, it had closed for the day but I've visited before. It houses some great art galleries and plans are underway to add a new restaurant. [caption id="attachment_222" align="aligncenter" caption="The Headwaters Arts Festival includes the Alton Mill."] [/caption] Alton was a thriving mill town. 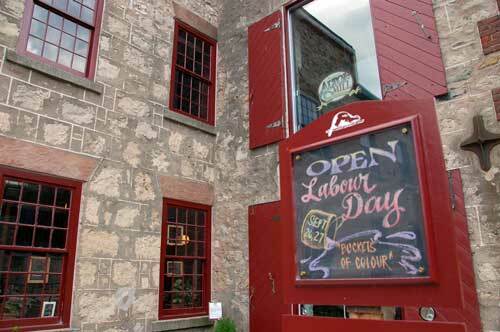 The Millcroft was built as a knitting mill in 1881 and made long underwear for WWI troops. According to a young woman I met outside of the Alton Mill, it was once a rubber mill that made rubber gloves and of all things, condoms. Apparently, the mill's old rubber molds are still in place. Now, there's a conversation piece. 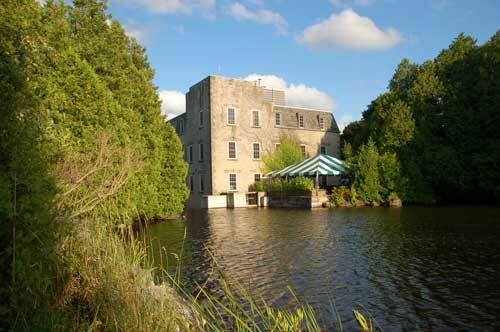 This fall, the Alton Mill is part of the Headwaters Arts Festival running from September 25th to October 12th. Ontario's brilliant fall colours will be at peak then and the Credit Valley Explorer, a local fall colour train, will be running tours out of nearby Orangeville. Perfect timing for a Millcroft getaway!